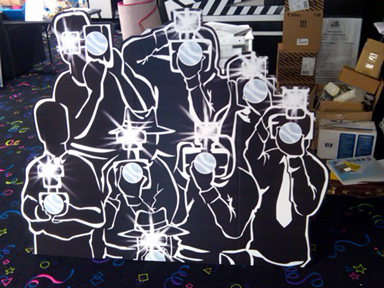 Hollywood Paparazzi Cutout Prop for Rent for your next party in the Washington DC Maryland Northern Virginia area. Talk of the Town 301-738-9500 event rental company. Hollywood Paparazzi Cutout - will let you and your guests feel like a movie star! Place a strobe light behind the cutout and it will look like the photographers are taking pictures of your guests as they enter your party. Add a red carpet, rope and stanchions,"step and repeat" and/or photographers for the full red carpet treatment! Cutout measures 6'h x 5'w. Strobe lights require electricity (110 volt, 11 amps).